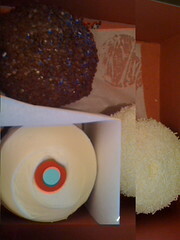 A Sprinkles Cupcakes opened in Palo Alto last week. I went on Wednesday, the 2nd day the shop was open, at 5:30pm. I waited in line for 25 minutes outside the store and it took approximately 35 minutes total until I was holding cupcakes in my hands. Since I waited so long I splurged and purchased four of them. At $3.25 each, they were not cheap. Overall I liked the cupcakes, but they were not my favorite. The cake was moist and had the appropriate texture and the frosting was acceptable, but nothing special. What I didn’t like was the cake-to-frosting ratio. I think this is a consequence of the fact that the cupcakes are mushroom shaped with a pronounced “muffin-top” that is much wider than the main cupcake. Since the whole top is frosted there is too much frosting for the actual amount of cake. My other complaint is that none of the flavors were interesting, they were all fairly generic. And while I am happy to eat a vanilla cupcake, I might be happier with something more exotic. 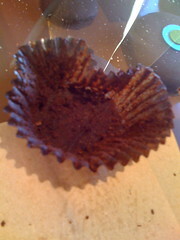 I did eat all the cupcakes within two days and they were certainly very tasty but I haven’t been back since. I am certain I will eat there again while shopping in the area, but I feel I can make equivalent or better cupcakes. Author planet1Posted on October 1, 2008 Categories Reviews2 Comments on Sprinkles!